Quality is cheap, but price is cheap... overall happy. Use a coaster to avoid damaging the veneer. Recommended. Combine elegance and a contemporary antique design with this two-drawer nightstand. The slim frame is accented by wide bar pulls and a dual color tone. Spacious drawers offer ample storage space and convenient bedside access. Dimensions 23.63 In. X 15.63 In. X 23.0 In. The drawers on my nightstand don't sit in the rails correctly and have to be lifted up and in to close properly. I'm frustrated because the size of this item makes a return/exchange a huge hassle. I like the color and style of this item, but it's cheaply made for the price. I do not recommend it. Great quality, no assembly required. Drawers are a little hard to slide out. Not happy with this purchase. I ordered 2 pcs but the drawer on one of the nightstands was broken. I am not sure if the damage was because of the shipping or if it was just cheaply made. It was just too big to return so we ended up keeping it but I wish I listened to negative comments here. Save your money and buy something else! Didn't read description well enough ..way too dark a grey ...wanted brown like pictured ...too much hassle to send back.My husband and I had a terrible time getting it out of the box...make that two boxes !! It can be so hard to tell if a product will arrive looking like the photos, and I’m so thrilled I took a chance on these nightstands. They are absolutely beautiful and look way more expensive than they are. And the quality is great too! It's nice that it comes fully assembled, but the drawers don't sit in the rails properly so they have to be lifted up in order to close. Annoying. Cheaply made for the price. I love the look of the furniture for my son's room. It really gives it a modern and masculine feel, but I don't think the quality is great. We've had to fix the drawers coming apart! 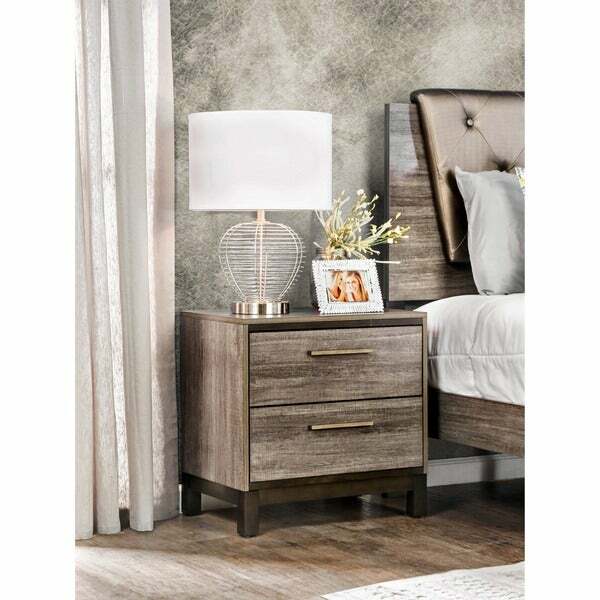 I really love these nightstands! They're made well and look great. Size is perfect for me. Looks good. These nightstands are not terrible for the price, but I probably wouldn't buy them again. I needed an inexpensive option for a quick move and these got the job done but the quality and overall look is just okay. They are perfect! All I had to do was attach the feet. Sturdy night stands that work well with our decor. The draers slide easily and have so far held up well. We bought two for our vacation house so not heavy use. "How much does the unit weigh?" Beautiful color and great price! I like the color and its design. Very elegant and contemporary.